Designed for classrooms, boardrooms and rental applications, the compact and cost-effective VP−440 features 4 HDMI and 2 computer graphics video inputs on 15-pin HD connectors. The unit includes both an HDMI and an HDBaseT output that simultaneously display the same scaled input signal. The Kramer VP−440 features a wide range of control options: front-panel control via a user-friendly on-screen display (OSD); RS-232 and contact-closure control; easy-to-use, built-in web pages over Ethernet; and bi-directional RS-232 port tunneling via HDBaseT. The product also features last-connected auto-input switching, giving users plug-and-display functionality. VP−440 has unbalanced analog stereo inputs for each video input and embedded audio for its HDMI inputs. The product also includes an unbalanced analog stereo audio output along with its HDMI and HDBaseT outputs. VP−440 comes with a microphone input and includes audio digital signal processing (DSP) with features such as audio equalization, microphone mixing and talkover, and delay. The unit also includes level control for the outputs and each individual input. VP−440 offers superior image quality with PixPerfect™, Kramer's precision pixel mapping and cutting-edge scaling technology. The product has a built-in ProcAmp that lets you individually set color, sharpness, contrast, and brightness. VP−440 also provides constant output sync, a feature that eliminates disruption on the output during input switching when no video is detected. 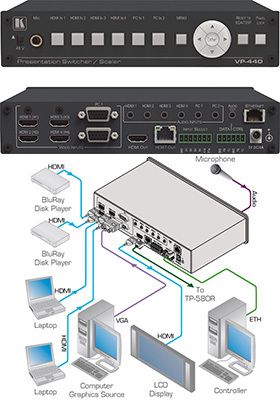 The VP−440 is unique in the company's line of advanced ProScale presentation scaler-switchers as a desktop-size, or half-rack-size, unit packed with functionality and features. Kramer's VP−440 is available in stock through KVMGalore. For other Kramer products - visit the Kramer store on KVMGalore.